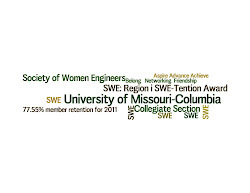 Mizzou Society of Women Engineers: Bowling Social Event! Sunday September 13 from 4-6 SWE is having a social event!! This is a great chance for old and new members to meet and just have fun! If anyone needs a ride there will be carpooling. We will be going to AMF Town and Country Lanes on Providence, directions. Email Michelle Boehm at mlbr27@mail.mizzou.edu if you want to attend or need to arrange rides.